More Fire! A processing experiment that combines Memo Akten's awesome MSAFluid library with a bunch of particles and OpenGL render target ping pong effects. 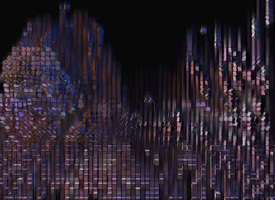 It's driven by motion blobs created through OpenCV. 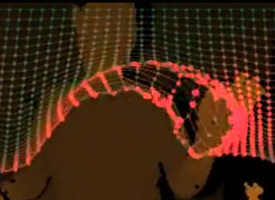 A kinect/processing sketch I put together for the 2011 "I am 8 bit" show in LA. Haven't captured the final incarnation yet. 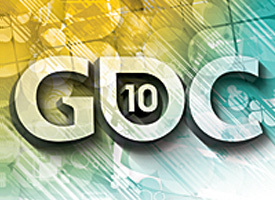 Pete Demoreuille and I had an opportunity to speak at the 2010 GDC. Many of the videos shown here were originally created for that presentation. 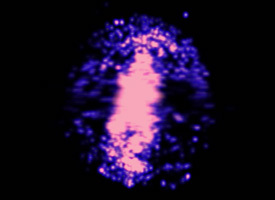 An example of particles being influenced by curl noise. See the Brutal Legend VFX Presentation from GDC 2010, or the paper we got the idea from, for more details. UV Displacement, aka UV Distortion, aka Pixel Offset, etc..., is a fantastically useful real time vfx technique where the particle texture lookup is perturbed by another texture. 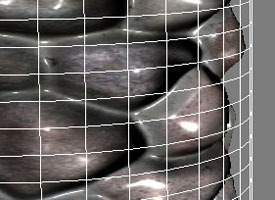 Usually that distortion texture resembles a normal map, and is scrolling, scaling, or otherwise given additional motion. 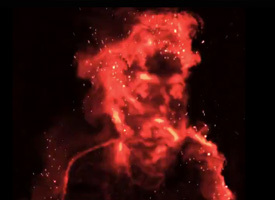 We found that by driving this displacement texture with a intensity curve, you could get very interesting visuals resembling fluids that break apart, or in this case, an approximation of the quickly moving gases that form a flame. 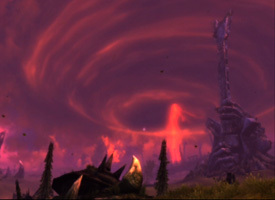 See the Brutal Legend VFX Presentation from GDC 2010 for more details. This video shows the ink rendering technology I developed for Brutal Legend with our graphics and animation teams. Ink was quite a challenge for us as Ophelia's character is in a constant state of flux between fluid ink and her solid form. 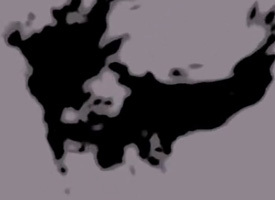 The final technique involved rendering the ink to a low-res buffer and performing some thresholding operations on it to extract the most interesting details (seen in the debug mode at the end of the video). Although it is taken in a graybox room, this is the same effect used in the shipping title. 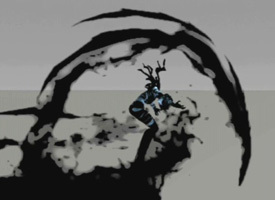 See the Brutal Legend VFX Presentation from GDC 2010 for more details. An isolated look at Brutal Legend's ink rendering tech. 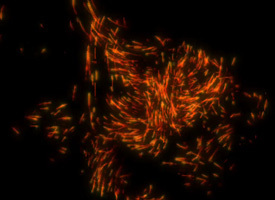 First regular particles are shown, then those same particles drawn into a blurred buffer, and finally that blurred buffer thresholded, and composited back onto the screen. Internally, we refer to this buffer as the Ink Potential. See the Brutal Legend VFX Presentation from GDC 2010 for more details. A smattering of vfx samples from Brutal Legend with shot breakdowns. Note that some elements of this video are duplicated on this page, but I figured it would be nice to have them all in one place. 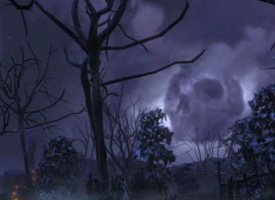 Showcases the climate variation in Brutal Legend. 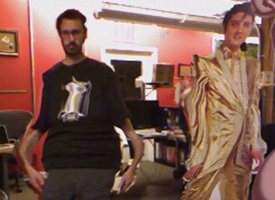 The first half of the video is time lapse, the second have shows different environments in real time. 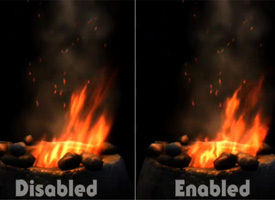 I authored all the scenes seen here using our climate system, which controls particle effects, fogging, lighting, weather variation, and post processing. 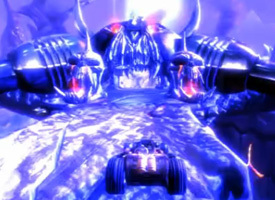 See the Brutal Legend VFX Presentation from GDC 2010 for more details. 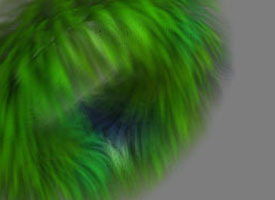 HLSL implementation of hair/grass using the "concentric spheres" technique. 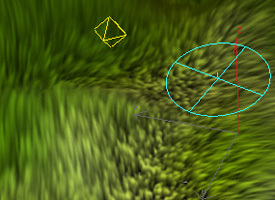 This version expects a per vertex force component to be passed into the shader via vertex data channels. In a separate max script, I calculate per vertex velocity, acceleration, and a compression factor which each have their own contribution weighting. 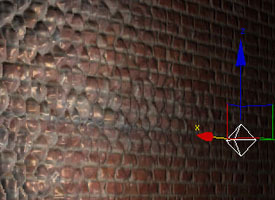 The results of the calculation are baked into the vertex data channels per frame. Alternate Video.